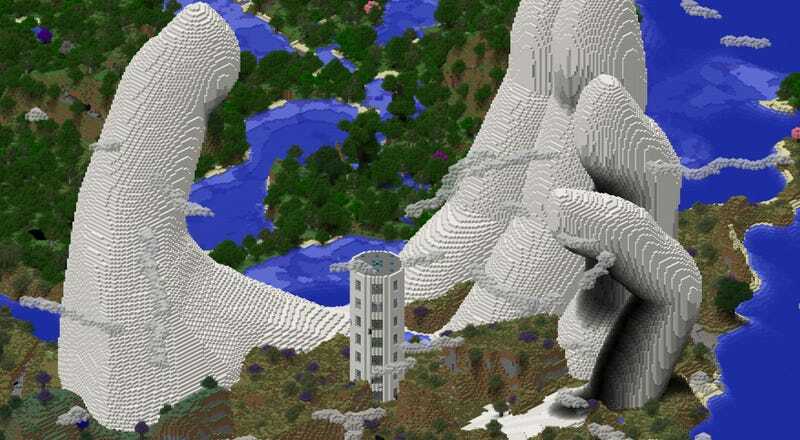 It took gmoff01 around 80 hours to build this in Minecraft. It’s made of 70,000 blocks of quartz. For those wondering about the details, no, he didn’t build the entire thing by hand, in the sense that he didn’t mine each block manually then walk along placing each one. We’re showcasing art here, not the death of a human mind. gmoff01 explains the process behind its construction here, but in short he basically mapped out a blueprint that he had open while building, then was able to fly around the map dropping the blocks in. Which sounds breezy, but with the size of the piece and the number of blocks involved is still one hell of a thing to go and do. 80 hours is still 80 hours. Below is a very cool video, which gives you a better idea not just of the scale of the thing, but takes a neat look inside it through a hole in the finger.